Each and every bank in India has a procedure to make a complaint through online medium. This saves a lot of time as you do not have to wait on the telephone line or you do not have to visit the branch to get the resolution. State Bank of India is the largest Public Sector Bank in India also has a procedure to make a complaint online. 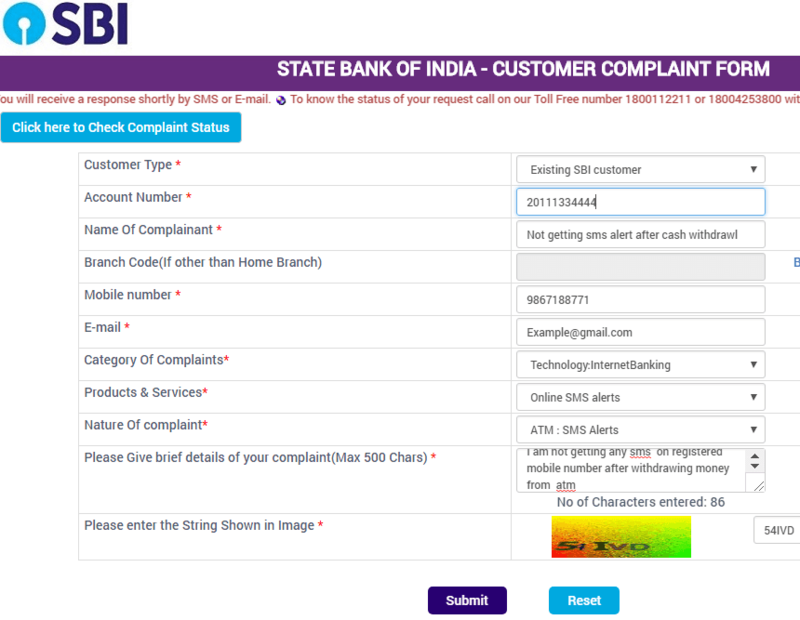 In this article, we have listed the procedure to register an online complaint with SBI. Before we proceed, it should be noted that to raise a complaint, you should have an account with SBI and in addition to this, it takes about 7 working days for the bank to completely resolve and close the complaint. So here is the procedure. Step 1: The first step of the procedure is to navigate to the CMS portal of SBI. If in case you do not have the link to the portal, you may click https://cms.onlinesbi.com/CMS/ and you will be redirected to the SBI CMS Portal. Step 3: After entering all the details, you would have to enter the captcha code and then you can click on 'submit' button. Important Notes: On successful submission of the complaint, you will receive a complaint number and it is important for you to note down the complaint number and keep it safe. You will also receive the number through SMS and Email ID which can also be saved by you. You can also track the complaint online through CMS portal. You may open link https://cms.onlinesbi.com/CMS/Status.jsp to be redirected to the portal to check the status of the online sbi complaint. It is surely very easy to check the status of the complaint and raise a complaint online. If in case you need additional support, you may contact the helpdesk by calling on 1800 112 211 or 1800 425 3800. These are toll-free numbers and you can call them and give them the ticket number to seek the status of the complaint. If in case you feel that your complaint has not been resolved then it is advisable to follow the escalation matrix and in the last scenario, the top level of escalation remains to be the banking ombudsman but remember that the ombudsman is the highest possible level of escalation and you will have to follow the hierarchy before reaching out to ombudsman. This is sheik Mamdani, ac no. 20078459873 I have tried to withdraw the money on 2nd March, unfortunately, amount not received, the amount has been deducted from my salary. Below transaction has been fraudulent as per details are given below. I have not received any SMS for this. I came to know only when I went to ATM to withdraw money on 15th Night. Then I immediately blocked my ATM card. Above captioned transaction have been fraudulent as per details and the same was not done by me and also my debit card is with me only and I have not shared me any card/pin details and I have not received any SMS for the same. I came to know about these withdrawal / Transactions only when I went to ATM to withdraw money on 15.09.2018 Night. Then I immediately blocked my ATM card and very next working day informed my home branch about the same. Pls look and investigate into these. Sir, unauthorised transaction on 31.12.15 & Dec 17 Rs 7185 & Rs 118.Please refund my amount accordingly Thanks. Apne aap refund ho jayega paisa. I have opened my Account on 11.06.2018 but yet now the account and ATM does not work. Several times contacted branch, but nobody to help regarding net banking kit, kit received also shows invalid ID & password. Also, branch manager made me walk four times to branch saying she has no time. Kit received also shows invalid ID and password. I think branch manager has no interest because I have very less balance in my account. Please help me. Hopeless complaint site. Tried for 3 days but could not lodge complaints. The site seems to be malfunctioning for making complaints online. Maybe a just deliberate attempt at SBI is unable to solve issues. I PAWAN GUPTA GONE TO SBI RAJINDER NAGAR SAHIBABAD GHAZIABAD FOR DEPOSIT RS3000/- IN MY SAVING A/C THROUGH GREEN CHANNEL ATM, DEALING EXECUTIVE ON DUTY ATTITUDE VERY ROUGH, HIS BEHAVE WAS UN TOUR ABLE FOR ME AND ALL THE CUSTOMER OF THE BANK. MY ACCOUNT NOS IS 30825488383 SAVING ACCOUNTS. My account was debited by sbi home loan racpc jawahar nagar jaipur branch without any prior information and SMS alert. There were, in fact, no dues pending to pay to sbi despite they deducted amount of Rs 8524 from my account and now i am enquiring about it and they are unable to answer any of my queries, in fact, they are denying for any such transactions they made after showing them the bank statement and detail of amount deduction. The deducted amount is not even fetching any detail in my loan account nor in their any account. After all where my money has gone? I have had Twenty –Five Thousand Rupees (INR-25,000/) in my account including my last month salary and due to some reasons yesterday evening (17th MAY 2018) when I went to withdraw the amount through ATM, believe me, I was totally stunned, there were only Ninety-Eight Rupees (INR-98/-)in my account, However it should be Twenty Five Thousand (25,000/-) and when I have checked the mini Statement it is showing that the first Transition of Ten Thousand Rupees at a time, again ten thousand and at last Five Thousand has been withdrawn from my saving account on 16th May 2018, and after contacting my home branch, Bank Manager has informed me that the money has been withdrawn at Malviya Nagar in Delhi and the Last Transaction is from Defense Colony Delhi on the same day ILLEGALLY, and believe me I didn’t share the pin or card no.with any one and moreover, how the money could be withdrawn in Delhi while I live in Lucknow. I AM REALLY CONCERN, IS THE STATE BANK OF INDIA NOT ABLE TO PROTRACT OUR HARDLY EARNED MONEY. HOPE YOU PEOPLE WILL TAKE A PROPER ACTION AGAINST THE SAME AND WILL FIX MY PROBLEM. Your Complaint has been routed to Branch: ATM SWITCH CENTRE for immediate redressal. The services of SBI are not good and also the behavior of the staff SBOP Nalagarh is not co-operative. Even I also faced the same situation that the staff's behavior is very bad at the customer if you have a doubt they don't clarify but get angry at them.I have given an application for transferring of my account from Assam to my native place on 28 /03/2018 but it was not solved till date. I purchased a few items from the shop and use my ATM to pay the bill through PoS machine but unfortunately the payment receipt didn't come out and at the end I have to pay in cash to shopkeeper but instantly I have received the SMS that my account was debited and even in mail also the debited statement was sent. When I told the shopkeeper that money has been deducted then he told that it will be refunded back within 2-3 days in your account.But I was sure that it will not happen so easily I called up sbi customer-care and they told me that my complaint will get resolved within 45 working days. To deduct the money from customers account is so easy but when it comes to refund back it takes 45 working days!. My ticket number is 4118900670. This link is not working properly https://cms.onlinesbi.com/CMS......so kindly provide other option to track the complaint. I have recharge my idea no. 7890669102 through net banking on 22/01/2018 and Rs44 was deducted but my mobile number not get recharged. Pl reverse the amount Rs44. I want to register complaint against SBI atm guard in uttar pardesh.